Fr. Sosa visited Homs April 5-6, and Beirut April 7, in memory of Fr. van der Lugt, delivering and address and celebrating Masses. Fr. Ziad Hilal, a Syrian Jesuit, told La Croix that Fr. Sosa was accompanied by Fr. Pascual Cebollada, the Society’s general postulator. In the homily at his first Mass, said May 30, 1971, Fr. van der Lugt said: “It is only when my hands are empty that I can really receive the other; to fill my hands with him, to give him space in my arms, to call him by his name, speak his language. (…) I found all this in one who fascinates me to the depths of my being, a man who was able to live simply, with empty hands: Jesus of Nazareth. Knowing how to live with empty hands, he always made room in his life for his Father and for his fellow human beings”. 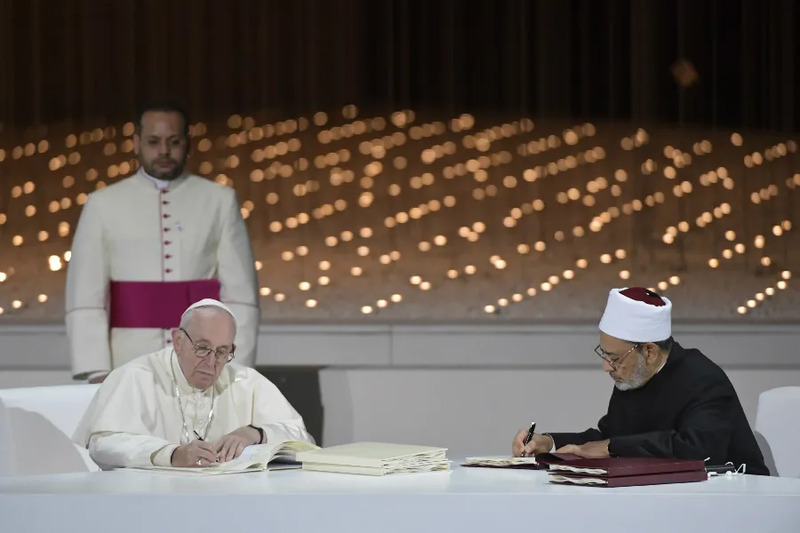 Abu Dhabi, United Arab Emirates, Feb 4, 2019 / 10:35 am (CNA/EWTN News).- In an interreligious meeting in Abu Dhabi Monday, Pope Francis said that for peace to flourish among religions, there must be justice, and respect for human dignity and freedom. Speaking at Abu Dhabi’s “Founder’s Monument,” which commemorates the founder and first president of the United Arab Emirates, Zayed bin Sultan Al Nahyan, the pope emphasized that is the task of religions to promote human dignity, particularly for the least and the poor. Religions “should keep watch as sentinels of fraternity in the night of conflict. They should be vigilant warnings to humanity not to close our eyes in the face of injustice and never to resign ourselves to the many tragedies in the world,” he said. Pope Francis, the first pope to visit the Arabian peninsula, is in Abu Dhabi, capital of the UAE, Feb. 3-5 to promote interreligious dialogue and give support to the country’s Christian minority. Before the interreligious meeting, he met for around 30 minutes with the Muslim Council of Elders. He then visited the city’s Grand Mosque with the Grand Imam of al-Azhar, Ahmed el-Tayeb, before paying his respects at Zayed’s tomb. At the interreligious meeting, the pope praised last November’s meeting, the first, of the Forum of the Interreligious Alliance for Safer Communities, which was on the theme of child dignity in the digital world. “Thus, to recognize the same rights for every human being is to glorify the name of God on earth. In the name of God the Creator, therefore, every form of violence must be condemned without hesitation, because we gravely profane God’s name when we use it to justify hatred and violence against a brother or sister,” he said. The four-and-a-half-page declaration condemned issues such as the taking of innocent human life, terrorism, world hunger, materialism, and a lack of equitable distribution of natural resources. “In conclusion, our aspiration is that … this Declaration may be a sign of the closeness between East and West, between North and South, and between all who believe that God has created us to understand one another, cooperate with one another and live as brothers and sisters who love one another,” it stated.